The Chicago City of Learning (CCOL) has partnered with Best Buy to support programs that use technology to inspire young people to build 21st-century skills and help them prepare for college and future careers. The CCOL initiative offers thousands of after-school and summer programs through partner organizations citywide, designed to challenge youth to engage in new ways of learning. Hands-on projects allow children and teens to work with everything from traditional craft materials to state-of-the-art technology. 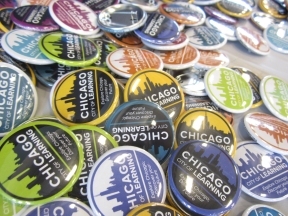 Hundreds of online activities are also available at ChicagoCityOfLearning.org. As a lead sponsor, Best Buy will offer Geek Squad Academy workshops to several participating CCOL outlets to teach Chicago’s youth about the latest technology. Through this program, Geek Squad Agents and Best Buy Blue Shirts engage young people through fun, interactive classes and activities such as robotics, 3D printing, and audio and video production. CCOL is led by the City of Chicago Digital Youth Network at DePaul University, and it continues to be supported by the John D. and Catherine T. MacArthur Foundation. More information on the Chicago City of Learning can be found at www.ChicagoCityOfLearning.org.